Zach Miller #86 of the Chicago Bears reacts after scoring in the third quarter during a game between the Dallas Cowboys and the Chicago Bears at AT&T Stadium on September 25, 2016 in Arlington, Texas. The Dallas Cowboys had lost eight consecutive home games going into Sunday's tilt with the Chicago Bears, but that streak ended as they picked up a 31-17 victory at AT&T Stadium. Zach Miller caught two touchdown passes from Brian Hoyer in the game, but it wasn't enough as the Bears lost their third straight game to open up the regular season. The Bears kicked off to open the game, and the Cowboys' offense immediately went to work. Ezekiel Elliott had a key run to start the drive, and Dez Bryant also got involved early as Dallas marched down the field. After Elliott converted on a fourth-and-inches, the Cowboys were able to finish off the drive with a flourish. After Jason Witten got the team to the half-yard line, Dak Prescott did the rest as he punched the ball across the goal line and gave Dallas an early 7-0 lead. The Bears' offense sputtered out of the gate as they went three-and-out on their opening drive. The Cowboys responded with another solid drive up the field, and even though Jacoby Glenn was able to break up a pass in the end zone, Dan Bailey knocked through a field goal on the next play to put Dallas ahead 10-0 late in the first quarter. The second quarter got underway with the Cowboys doing the same thing they did in the first. Jacoby Glenn was badly beaten over the top by Beasley to get the Cowboys within striking distance, and Lance Dunbar powered his way into the end zone to make it a 17-0 game. The Bears finally got their offense going in the second quarter, as Jordan Howard bulldozed his way down the field for a 37-yard gain. A short gain from Alshon Jeffery helped get the Bears closer, but they had to settle for a short field goal from Connor Barth. Unfazed, the Cowboys romped right back down the field and scored again. After Prescott gained a significant chunk of yardage on a run, Alfred Morris finished off the drive with a dive over the goal line to put Dallas ahead 24-3 with less than a minute remaining in the half. 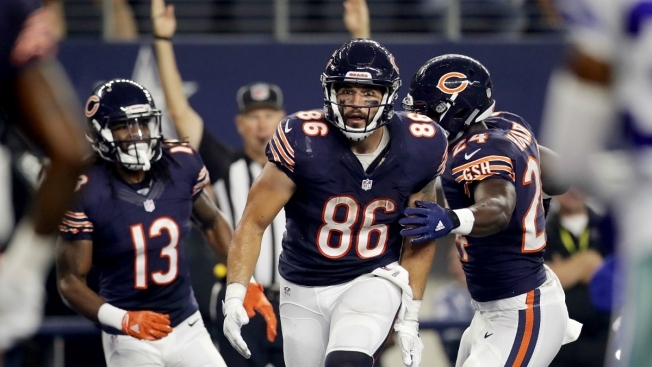 As the third quarter started, the Bears' offense began to slowly show signs of life. Zach Miller made a big play to get the team within striking distance of the end zone, and then on fourth-and-goal, the big tight end hauled in a touchdown pass to bring the Bears back to within a 24-10 margin. Unfortunately for the Bears, their defense couldn't keep up with the Cowboys, and Prescott continued to dominate in the game. He finally got on the board with his first career touchdown pass, as he found Dez Bryant near the goal line and the big wide receiver dove into the end zone to push the lead back out to 31-10. The Bears did get one more touchdown from Zach Miller to make it close, but after Hoyer fumbled the ball away late in the fourth quarter, the Cowboys were able to run down the clock and finish off their first home victory in more than a year. The 0-3 Bears will now lick their wounds and get prepared for their first divisional game of the season, as they will take on the Detroit Lions next week.